Round 1 is over, which means you’re either stoked or suicidal, and rarely anywhere between. The sum of a range of events, such as your Captain choice, unique selections, volatile premium picks and vest distribution culminated in one, solidary score. This week’s edition of the Bullets examines everything that went into your Round 1 Dream Team. Check it out! Round 1 is over, which means you’re either stoked or suicidal, and rarely anywhere between. The sum of a range of events, such as your Captain choice, unique selections, volatile premium picks and vest distribution culminated in one, solidary score. One single four-digit number to sum up your lengthy pre-season (mine dates back to the Draft! ), however unfair it may be. Hopefully, you made more right choices than wrong and ended up with 2100 plus this week. If not, there’s always another week to redeem yourself. The footy, in general, was amazing this week. The majority of the games were fast-paced, free-flowing and high-scoring affairs, which made it highly entertaining for us viewers regardless of the result. Although, many also went down to the wire. The high-tempo nature of the games has serious DT consequences for us. The graph below shows the how much the better scoring fantasy team outscored the other versus the actual game margin. You’ll notice that in 8 of the 9 games over Round 1, the winning team also earned more DT points. 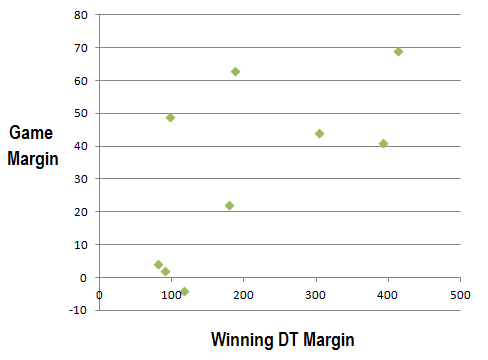 You’ll also notice that the trend was pretty clear; the more you win by, the more DT points your team scores. This notion isn’t ground-breaking – we’ve always known that the better teams score better fantasy-wise than the weaker teams. But with the AFL seemingly being played at a higher pace this year (only 1 round so far; I know, I know) we are seeing a domino effect take place. The players get tired, the game breaks open, the fitter team gets more possessions, the team with more possessions kicks more goals, and the team with more goals wins the match. Never have the winning teams been more likely to score well, which looks good for Hawthorn, Carlton, Fremantle and West Coast players, but not so good for Melbourne, GWS and the Gold Coast. Those cramps? Apparently, stomach cramps. We all had those nagging 50-50 calls to make in the hours leading up to lockout (or more accurately, lockouts), but did you stay firm or did you crumble? These are the decisions which haunt you all weekend, and if they are bad enough, the entire season. Personally, I crumbled, which makes me want to turn back time and slap Friday’s Tbetta right across the face. Multiple times, and hard. Here are a few last-minute calls you might have been juggling mentally in the final hours of unlimited trading. This was the big one for me, and while it’s early days, I can’t help but think I’ve made the wrong decision with who has become affectionately known in my house as ‘Trollby’. In poor games from the both of them, Hargrave only scored two points more, but comes $33k cheaper and played significantly better opposition in West Coast than the Dees. Both were on my radar for the infamous title of the Yarran Dilemma, and I think it will end up with Golby, who played a much more lock-down role than in the pre-season. The silver lining is that at least I didn’t go with Lake. Those going with a 1-3 ruck structure looking for a Premo Ruck to hang their hat on were basically left with Mumford, Coxy and McEvoy. Sandi and Leuey were under vague injury clouds, while Goldstein was hard to back in with H-Mac lurking in the background. And with Mummy locked out from the GWS-Swans standalone game, it came down to McEvoy or Cox. So who won? I’m calling a draw. Cox scored 107 but was priced at exactly that, while the Big Mac contributed 86 in a loss but came significantly cheaper. With Swan underperforming again in the pre-season, many questioned whether he should be included in starting squads this year. Meanwhile, Pendlebury was just plodding along, steadily improving every year since his inception and looking switched on over the pre-season. In the end, Pendles took Round 1 (literally) with what will probably end up being a 3-vote game, despite Collingwood losing the match. Swanny was his unassuming self but didn’t connect up for as many +6 combos as he usually does when he’s at his best. This was one I was considering myself with my M8 needing to be filled, and I gave myself every last minute to make the call. In the end, Clay being named in the guts convinced me over an unnamed, although seemingly best 22 Lachie Neale. It was a good choice in the end, with Smith dominating in his first game with 4 goals from 13 possessions before being subbed out in the 3rd quarter with cramps. This was one pretty clear cut. I know a few coaches who were looking to fill a D9 spot after Ellis, Morris, and Bugg were already locked out. Options were few and far between, with Yagmoor and Smedts seemingly better options than Paine and Tynan, although the job security was non-existent between the lot of them. As it played out, Yagmoor managed only 8 before being subbed out, while Smedts started well but faded for his 50. Like I said, job security is a big issue here, so not really a win either way. The pre-season has seen many different team structures and strategies, some more out there than others. It’s only early days, but let’s see which strategies are paying dividends and which are costing coaches early. It’s not the most out-there structure going around, but it definitely goes against the common school of thought over the last few years. While most Premo rucks scored 85+, it’s the rookies who will prove whether this structure is boom or bust. And it’s looking good so far, With Giles scoring 77 last week and Redden backing up some impressive pre-season numbers before being subbed off on 68 at 3Q time. Orren in the only issue at this stage, subbed out for a disappointing 22. One of DT Talk’s more outspoken readers (and I hope they don’t mind me sharing their plight) went with a 6-gun midfield, most of which were Premo DPP links to the backline and forward line. This left them light on with Premos in other lines, forcing a few extra rooks and mid-pricers into the fray. While the midfield of Fyfe, Murphy, Selwood, Goddard, Deledio, and Goodes was serviceable, it left the back and forward lines pretty bare and condemned McDonald’s 98 to the bench. Final score was in the 1800’s. A big shout out to my Dad, who knows his sh*t, but doesn’t have enough time to throw together a well-researched Dream Team. Instead, he chucks in players who he thinks will have a break-out season, and keeps going until he has 30 players under the salary cap. This produces gun picks like Merrett (83), Cotchin (120), Douglas (109), Kreuzer (96), Tippett (114) and Darling (92). Unfortunately, you can’t get everyone right, with Danyle Pearce (35) and Butcher (37) sneaking in there as well. Impressively, this team still hit mid 1900’s. As we all know, Calvin went with this structure after sustained success to fellow DTers in the past. The thinking is spot on, as it netted the Calvinators north of 2100 points. The key here is picking the Premo mids that will be in the top 7 or 8 at season’s end, and the midfield of Swan, Ablett, Boyd, Selwood and Mitchell is exactly that. It didn’t hurt that they all topped the ton in Round 1. A lot of big ‘uniques’ in the Makers this week, which is fundamentally what makes them Makers. Stanton lead the way with 37 disposals( including a huge 26 kicks), 7 marks, 5 tackles and 2 goals for a round-high 153. It was a complete performance from the hard-running and much-maligned Bomber midfielder, who I guarantee was spared the boos from his own crowd on Saturday night. It was great sign to see that more than half his disposals were contested, which has been a knock on him in the past. Adcock was one of the few defenders to raise the bat, and the best part about it is that he only rewarded the 5% of coaches who picked him. Jed was often released into the midfield and hence collected 29 disposals for his 125 in a pleasing performance. Keep in mind though, it was only Melbourne. Sloane was much-hyped as a breakout contender this pre-season, but only 2.6% of coaches jumped on. They were well rewarded for their faith with 125, thanks to 24 disposals and big 9 tackles. Although it was only the Gold Coast, the signs are good for Sloane, especially with Adelaide’s cakewalk of a draw. Nat Fyfe is a gun. That is what I learned on Saturday night, something that I almost forgot over the pre-season. He will earn the 3 Brownlow votes for sure, with all of his 30 disposals eye-catching, as were his 2 goals. It was only his 5 frees against that prevented The Knyfe from pushing 150 instead of just 124. Pendlebury is the favourite for the Brownlow this year, and with great reason. He is a true big-game performer, as his 29 disposals and 2 goals in a loss suggests. He is untagable in the sense that he always finds space in seemingly unnegotiable traffic, and you can’t run with him all day because he’s just too fit. A great bet for your DT if you got on him – his 132 against the Hawks makes me think he’s only getting better. Lake… I never forgave him after last year, and I’m glad I was harsh on him, because it prevented me from getting sucked in. His 29 won’t be a regular thing, but it does prove that he is prone to these sorts of scores regardless of his obvious talent. Broughton is just as likely to feature in the Makers as he is the Breakers, which is one of his more despicable qualities. Although, Lyon is probably more to blame. Ross, if you’re going to play Broughton in the mids all pre-season, I damn well expect you to play him to play there in the home-and-away season. Nobody likes a tease… Regardless, if you got sucked in, 59 points hurts. 38 points from a decorated gun like Enright is not what we have come to expect from the Geelong playmaker. 9.1% of coaches probably feel the same way. I don’t know why he didn’t score like he has in the past, but he was basically a non-factor in the Fremantle match so I guess it’s no surprise. I’m coining the phrase ‘See-Shaw’ now, which I think adequately sums up how Shaw can go from being so potent one half to the fantasy equivalent of a leashed Jack Russel the next. He can have as much desire and enthusiasm as he wants, but as soon as the opposition decides to put the forward tag on, it’s over for DT coaches. Those who elected to start Morris will be dirty with his 27 on Thursday night. He looked great in general play, putting his body on the line on several noticeable occasions. But this is DT, not the Army Award, and his 27 hurt for those who could easily have had him on the bench. One of my favourite parts of the Bullets is the Tweets section. Here are a few tweets that I received at the close of the weekend. As you can see, the overwhelming topic of discussion for DTers this week was Gregory Broughton and what on earth to do with him. 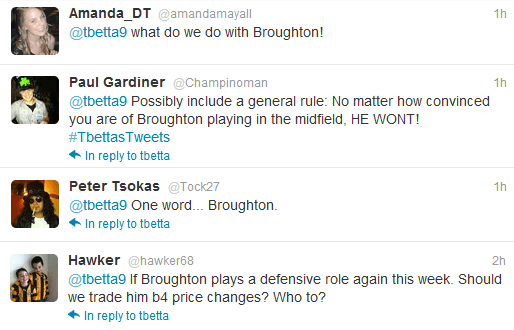 As a fellow Broughton owner (and spruiker, at times) I think we need to keep level heads and give him another couple of weeks. We know he’s a gun, especially when he plays in the midfield, and it was only that lockdown role that prevented him from continuing on how he started in the first quarter. He won’t play that role every week, especially against weaker opposition. Let’s give him some time. Sometimes I think the best thing about an LTI is that it gives you a chance to downgrade to a performing rookie when you otherwise couldn’t justify doing it, someone like a Magner, Clay Smith or Kennedy. But I don’t think this is one of those times. Parker will be back in a couple of weeks, and like I mentioned last week, he scored readily in the time that he spent on the ground. You obviously picked him for a reason, so I say back him in, and back in your midfield rookies until he returns in 2 or 3 matches. Firstly, 89 points in not that bad… It was definitely improved by junk time, and it was against a bottom-three team. But to answer the question… No. My gut says that he the ball-winning ability he has always had, has finally mated with some consistency and endurance to give birth to a more impactful player, and ultimately a better DTer. His first-up performance was nothing like his pre-season though, I’ll admit that much. Every year we prepare ourselves for Round 3 and the fix-it trades that we can use to improve our team before the price fluctuations kick in. While I strongly suggest that you don’t trade after just one round, here’s a few things to keep your eye on for Round 2 in the interest of fix-it trading. # Lake’s effort in Round 2. If he still appears rusty and self-orientated, and especially if the Bulldogs can’t get their possession-happy game style to click, consider cutting your losses on him. Hargrave, Golby and Conca are still in the ballpark price-wise, otherwise consider downgrading to Bugg if you missed him the first time around. # Underperforming backmen. I mentioned Shaw, Broughton and Enright earlier, and if these guys have another poor outing their prices will plummet. This isn’t such an issue if they end up being keepers, but if their low scores continue, you’ll find it hard to afford a decent replacement later on. Adcock, Waters, Birchall and Heppell are a few guys to consider at that slightly cheaper price-range, especially if they back up in Round 2 with big scores. # Adam Kennedy’s/Clay Smith’s/James Magner’s Round 2 score. If you missed these guys originally and they end up pumping out a big back-to-back score, then you have to consider getting them; a la Curnow last year. They will be virtually guaranteed price increases over the next three rounds, and it could help you fix up a rookie dud. This is true even more so with Kennedy, who could be traded into your forwards for someone like Dickson (37). Round 2 is sure to be another big week, with yet another partial lockout to manoeuvre, thanks to the Brisbane-Carlton clash on Thursday night. Again, to exploit the lockout you’ll need to have someone on your field not playing, which is a consolation for Parker/McDonald/Neale (possibly) owners. I won’t be attempting it due to my lack of Premos from either club, but if you have Gibbs, Murphy, Rockliff or Redden, I say go for it if you can. Also, remember that there’s no League match-up again this week. It all starts in Round 3, so you have another week to get your team ship-shape and ready for battle. In some respects the first two rounds is like a mini pre-season, where we can trial our rookies and figure out the best set-up going into the real stuff. Anyway, good luck! May your league ranking be high and your trigger finger remain itchless. Tip of the week: Get your starting rookies right! The difference between Bugg, Magner and Kennedy & Morris, Shiel and Dickson was a massive 216 points. P.S. A big shout out to the DT Talk Tbetta League, who was ranked 131 overall this week! Great effort guys. I agree with everything except the trading of Swannie, although I had Birchall all preseason and last minute traded him for Broughts. Doh. Its a tough one that Ill have to mull over for a couple of weeks. The way I look at it Swan and a rook isnt as strong as Sloane and Birchall. I could go for another rook, that would mean I have Morris, Ellis, Clarke, Bugg and another rook with is a very very risky ploy. Far more risky than downgrading Swan. I could always sideways to Hargraves, would just be happy for Lake to pull his finger out. Another question, is Bugg now on the field instead of Lake? so why the hell did you pick swan in the first place? he scored 102. You gonna be dropping guys for scoring tons all year? Its not about dropping him, more like using his cash to right some wrongs in my initial squad, like Lake.Then can grab him after the byes if he is cheap enough. Its all just talk at this stage and results this week will really determine what I do. I finished around the top 100 last year and always do two trades round 3, so Swan is the extreme but constructive discussion is what this site is all about isnt it? HEATER: I’m going to keep a close eye on this game with 3 dud defenders playing including the Dud of the Week, Heath Shaw. Although I’m reluctant to trade out a premo so early, I’ll have no choice with another sub 60 score. MILERA: He’s a very unique fwd rook who pumped out 74 and looked very sharp yesterday. If he can score 75+, he’s in for Dickson. Anyone know he’s job security? i have porp, d smith and A. Hall. I would either go Callinan or a rookie. thanks mate also what do i do with lake? On a more serious note. I’m facing similar questions with Lake (who may as well be injured). I already have Hargrave, but I think for you that could be a good option, even though his game was below expectations for me (most of his score came late). I don’t really like the double trade option either. It depends a bit on what rookies you already have. If there is a really good rookie you don’t have then downgrade for sure, otherwise you may be better to leave him on the bench and make him your first upgrade. It’s a hard call though. You’d have to be joking? if you have someone on the bench who can play for him without costing you too many points, still wait a week, and see if anyone pops up. 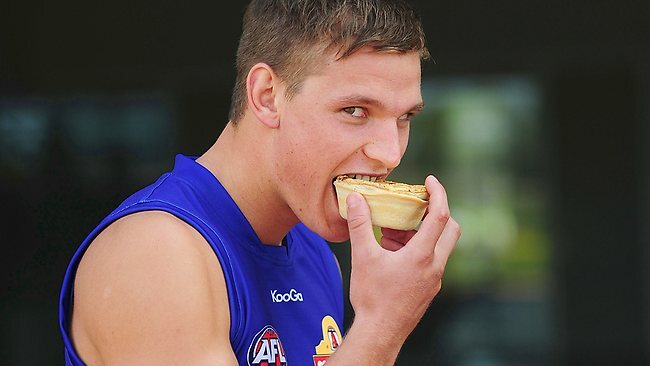 Is anyone considering trading out McDonald after Round 2 for another gun midfield rookie? I do not have C. Smith so McDonald to Smith is very tempting. If McDonald kills it in Round 4, I would likely try to get him back in, probably for my worst rookie who had had 2 price rises. Doing this would use 2 trades, but could make a lot of cash. Is anyone else thinking about this play? Horrid idea mate. If you don’t already have Old Mac it might be a good play, but getting rid of him then getting him in 2 weeks later? Not smart. It is definitely an aggressive move, but I’m not convinced its as unfounded as you think. At worst this is 2 trades for a lot of cash, but it also gives me the chance to get Smith who has the potential to outscore my other rookies. I might run some numbers. First off under your scenario it would be 4 trades in total since you are counting McDonald out, Smith in as 2 trades. Also in the trade where McDonald comes in I would make 2 price rises on a mid rookie which will be at least 100k. So a more realistic setup for this would be 4 trades for 700k, so 175k per trade (assuming Smith and McDonald average 80ish as above) is probably fairer. Now, obviously by letting your cows mature fully you are going to maximise your profit per trade, but you might find that you have no downgrade targets left. The Round 1 starting mid rookies can make as much money in a couple of weeks as some of the later year rookies will make if left to mature fully. The game isn’t about maximising profit per trade, it’s about maximising points over the season. This strategy would allow me to get all the best cash cows and generate some cash very fast, so I could upgrade after Round 4. I’m not sure if it’s the best way to go, but I certainly don’t think its completely moronic. If Clay Smith gets 110 next week is it worth getting him? If McDonald gets 100 in week 4 is it worth getting him then (whether you had him and traded him out or never had him is completely beside the point)? For me, passing on players that could turn out to be the most valuable in the game has its own risk. No, it’s a completely horrible idea, there isn’t any way around it mate. And you wouldn’t make much cash out of it at all, 2 of clay smith’s price rises at the cost of 2 trades. i don’t think he’s going to listen mate. Just incidentally where did you finish last year benny? I reckon go for it Portet… the worst that can happen is it doesn’t work, but at least then you’ll know for sure. But if it does work, you’ll be ahead of the curve and that’s what it’s all about really. If McDonald got suspended for 6 weeks, then this would be a no brainer (assuming that Smith scores well next week). The fact that McDonald gets traded out, then back in doesn’t in and of itself make it a bad strategy. Since he is only out for 2 then the cash generation is limited, but I believe is worth thinking about. It also likely depends on the rest of your team. I don’t know how I fell for the preseason hype, but I put Lake in at the last minute. He looked fat and slow and although he is likely to improve from 29 I can’t see him scoring well enough to be a long term prospect. Which solution to the Lake problem is better? I think you have to consider everything together. Alot of people are going to burn a trade getting rid of Lake this week. I was one of the people burnt by Lake last year. I didnt know he was injured, So i told myself never again. This year i realised he was injured last year, so i gave him another chance. Yes i know he did crap but he played against Cox and Nic Nat who were resting up forward.. So of course they never went ball hunting down the ground. So he was stuck in the Goal square. And its almost impossible winning a marking contest against those 2. Next week if i’m correct, he’s playing Adelaide so he will probably be on Tippett and i wont be surprised if he follows Tippett up the ground if Tippett goes ball hunting. This can see Lake rack up his usual points. Keep him in the team one more week..
Keep Orren Stephenson. He doesnt need to do much to get a price rise. Shaw is a gun.. plain and simple.. He wont always cop that forward tag. Would you start Lake over Bugg or Clarke? Leuenberger better lift this week. Really hope someone breaks Ben Hudson’s leg. I thought the Berger had achilles problems and that’s why he won’t be a factor this year. What were you expecting from Jetta? There is DEFINATELY some weird suggestions going around! Trade guys out & back in later? On a separate non dt issue, but re DTTALK, did Good_Evans break the WordPress Smiley Codex?? Nonsensical approach to trade out the likes of Swan, Porps and Lake after 1 week, all could ton up and next week……Heard a rumour that the DT Talk Guns League were 2nd overall………………………. if so thats a league i want to join. hey what Iv’e noticed this year is that the average score of anybody is much higher than the last cople years in the 1700’s. This could either mean great help from sites like this is improving the whole dt community or this game is getting easier with gws’s rookies. I think’s its a combination of the 2 as well as the increase in DT points scored by players in general. Previously 80s and 90s are good scores but players are smashing huge 130+ scores. Players staying on the ground longer due to less spots on the interchange bench plus mature aged recruits have increased. I don’t understand why you don’t just get Clay Smith in AND keep James McDonald – if you’re going to trade your worst performing rookie to get McDonald back in, the trade will probably only make you about $50k, which is absolutely not worth it. Oh god, this is meant to be in reply to porpetdaspet up above. Stupid internet cutting out. Don’t apologise… you’ve tried warning him. Anything he does from this point isn’t your fault. I really hate 3. (assuming of course that all 3 of these guys score well this week) and giving away a super premium mid seems like a backward step so I don’t like 4. This only leaves 1 or 2. If Smith gets 40 in Rd 2 and is dropped for Rd 3 then my choice will be easy. I’d be interested in any opinions on the best way to go. I think Greene had a really good game against Sydney. He seemed to be at every contest and ran out the game a lot better than most of the 18 year olds. He probably won’t play every game, but I’d be surprised if they couldn’t find 5 guys to drop ahead of him based on that game. Forget about option 4, that shouldn’t even be an option! BLASPHEMY! Seriously, do you need Smith? Everything is an option, but I don’t like 3 either. That’s just too much money to be left with, plus it would probably get messy later. This is only really a problem for me is if Smith kills it this week. He’s understandably in a lot of teams, so if he goes on to average 90-100 for the year (not beyond the realm of possibility) I would be at a big disadvantage. For 2 trades I could make over $100k plus the information that would leave me with the best 4 rookies this year. Certainly leaving him alone is the safest option. I’m not thinking about it for this week. It’s a Round 2 question. Oh my god! You asked for people’s suggestions and you’re knocking all of them back. If you knew you were going to waste those trades, why post it? If your head says 1 and your heart says 2, what are you going to listen to? And vice versa. …DT Rule No. 2: Always wait till after round 2 before trading. A lot can happen in 2 weeks…. Always wait the last possible minute. That way you have another week to analyse Adcock’s and Smedts’ scores to see if they’re the right players to trade in as well as seeing Lake and Conca before deciding if it’s worth trading them out. I think saying to never trade in Round 1 is a little limiting. Say for example, Golby scored 110 in Rd 1 and looked great (I know he was actually kinda shaky) and you missed out on a couple of great rookies. In this case, Lake to Golby after Rd 1 would be very logical. On the whole I agree though. Especially this year, with the MBR’s, we may need a trade or 2 or even 3 in rnd 10, to enter rnd with the right structure. I really want to have an 8/11/11, or 8/12/10 format going into the MBR’s, I’d like to have this set up at round 9/10 but anything can happen in round 10 to wreck the structure! Trades TY aren’t gold, they’re platinum!!! I traded Duffield to Shaw 5 minutes before lockout for safety. Heater scrapped a 56 and Duffman pumped out an 86, I paid an extra 107k for a decrease of 30 points…. If Heater gets another sub 60 score and Duffman/Waters gets another 80+ score I might be tempted to downgrade Heater to one of them… Also If Clay Smith gets another 70+ and Coniglio gets another sub 70 score i might go Cogs to Smith and pocket the 70k. Or am I getting a bit trigger happy? Round 3 is always a good time to trade to guarantee the price changes. However I think you’re being premature with your options. Shaw is always a bit inconsistent, but you know he can pump out the huge scores and he’ll start as soon as you get rid of him. Also trading out a midfield rook after one average score. He’s got great JS, and lots of potential. Way trigger happy! Unless you’re going to lose significant points playing them, you’re wasting your trades. Shaw will average more by the end. DT Talk WA League ranked 32. How are the other state leagues going? DT Talk WA 2 is ranked 88 which isnt bad, i think after looking at the scores and teams this is around where it will stay. Hopefully, however I hope not to much as I would like to win!!! I accidently picked up jack last year too. He ended up staying thier all year. We wont have that luxury this year with only 2 em. positions. Brought neile in, to cash into kennedy 116.
will he play this week? Or Bolton to Stanton with a bit of cash. Or Bolton to swanny or Mitchell or Thompson or basically any other gun mid? fair enough too. If you can get bugg and add cox to your lineup then it might be worthwhile. Mate its round 1. You cant trade in rookies expecting them to pump out big scores week in week out! Its highly unlikely bugg will get another 90+ score this week. Ellis might get 90 this week and Bugg could get 38. Huge waste of trades…. Hey did anyone have all of them breakers on the field in their back line? Collingwood was playing Hawthorn, proabaly the contender for the Grand Final this year!!! So the Hawks tagged shaw and the game was a pulsating cracker until Buddy took the game right at the end…. My advice hold on to see what happens, I held onto Goddard last year and he came good late on. I had 4 of the 5 breakers, and with no chance of winning the car and pretty much only looking for league bragging rights (along 99% of the DT’ers on this site) I’m not too stressed at Lake, Broughton, Enright and Shaw going low in Round 1. They are all proven scorers over the distance and will all go up this week, no doubt. Ohhh how i missed the blood curdling dreamteam trade decisions!!! Im almost sure my life would be easier without dreamteam in it yet every year come back for more. I need help guys should i keep broughton and shaw? Or trade one of them out for adcock who i had as a locked in player all year until about an hour before round 1 lockout. If u think yes which one should go? Don’t make any trades yet – wait until after Rd 2. I have Shaw also but I picked him as a premo and I’m not ditching him after 1 bad performance. thought on Geary anyone? Perhaps he is not going have such a defensive role under waters and did score reasonably well in 09.
why oh why would you have broughton when you can have beau waters, hargrave, birchall, suckling….